I’ve been using this definition for many months now, but it often seems to fly past people. I want to underline it here as this web maker audience is central for all the learning programs Mozilla is developing this year. PS. here is a PDF of the slides from the talk Michelle and I did. Can also send Keynote to anyone who wants to use these. Mozilla exists to make sure the internet stays open and awesome. With Drumbeat, we’re moving beyond Firefox to build more things that make the web better — not just software. We’re doing this by reaching out new kinds of people — teachers, filmmakers, lawyers, journalists. These people will play a key role in shaping the future of the web. This is similar to what I presented at the Mozilla Summit in the summer, but much simpler and easier to repeat. So, I figured I should share it. A common Drumbeat questions is ‘what do you mean by open web?‘ Having a solid answer is especially critical as reach out to teachers, lawyers, filmmakers and other people new to Mozilla. Freedom: built with technology and content that anyone can study, use or improve. Participation: anyone can participate or innovate without asking permission from others. Decentralization: the architecture is distributed and control is shared by many parties. Generativity: we can make new ideas from old ones. As we use, we also hack and innovate. Open web = freedom, participation, decentralization and generativity. This definition is inspired in part by Mitchell Baker’s ‘better internet’ talk from about a year ago. It was also shaped by responses to Mozilla’s what is the open web? contest from earlier this year and by other attempts to define the open web. One issue we bounced around on was whether to talk about transparency (we had that in earlier edits) or freedom (the ‘study’ element of software freedom covers ‘transparency’). The current version uses freedom both because of its breadth and because free software and content are clearly core building blocks of the open web. Could be too arcane for the Drumbeat audience? Keep in mind: our goal is a working open web definition for drumbeat.org, not something canonical. It should speak to people who aren’t necessarily technical and suggest how they can shape the web. At the same time, it needs to be sound, encompassing the primary ingredients we believe make up the open web. The plan is to put an expanded (and likely evolved) version of this definition up on drumbeat.org later this week. If people like it, maybe we can use it more broadly in other venues. Who knows. Comments and suggested improvements welcome, as always. Almost five months into 2010, key Drumbeat projects and the Drumbeat local event series are picking up speed. Web Made Movies, Universal Subtitles and P2PU Open Web Career Track have all released new material and gotten more people involved. And additional events have taken place in Toronto, Berlin, Sao Carlos and Florianapolis. We’re also making progress on our overall fundraising and engagement efforts — albeit slower than hoped. Of course, support like this isn’t an end itself — the real goal is to make sure Universal Subtitles succeeds in bringing open video translation to the web. But it’s still good to see that the Drumbeat concept of bringing new people to participate in projects that improve the web has at least some early traction. As we go into the summer, we’ll need to make some decisions about where to push hardest on Drumbeat for the rest of the year. The current plan is to focus on a few key projects build up strong participation and impact — the ones mentioned above plus a few more based in Europe or Brasil. We also want to pick a handful of cities to really invest in where we can get a vibrant community going. Sao Paulo is one of these. Berlin may be another. Finally, we need to pick a theme for the 2010 Drumbeat Festival. The current thinking is something around education (‘learning, freedom and the web’). You can also view this in open video (ogg theora) or download the slide deck (PDF). This slidecast offers slightly shorter version of info presented at our most recent board meeting. I’ll continue to provide these updates every two months, following the board meeting schedule. Comments welcomed here on my blog or by email. A few weeks back, I posted an updated Drumbeat description. People said it was good, but not good enough. We’ve pushed hard to come up with something better and crisper. These result is a simple set of key messages that explain Drumbeat and why it matters. We’ll use these to write site copy, update our slide decks and drive our upcoming social media campaign. I’ve pulled the current version from the wiki and pasted below. It’s very close to final — we’re turning it into new web site copy as we speak. Feedback and tweaks welcome. As always, we’ll iterate. Drumbeat is about keeping the web open. We’re building a movement. We want to keep the web open for the next 100 years. Where to start? Everyday web users making and doing things that help the open web. Drumbeat’s role: host projects and events that gather smart, creative people around big ideas. We all benefit from the open web. It’s the most powerful communication tool in the history of humanity. The nervous system of trade, education, governance, activism, and play. Lets a single idea achieve global impact. All without needing someone else’s approval or permission. But we can’t take the freedom of the web for granted. There are many who would neuter or control the web we have built. Imagine an internet filled with devices you can’t tinker with and walled gardens. What’s at risk? Privacy. Access. The freedom to create and innovate. We need to protect it. Improve it. Grow it. We helped keep the web open when 20,000 of us built Firefox. And we’ve been continuing that work ever since. It’s what we do. It’s all we do. And we’re known to do it well. 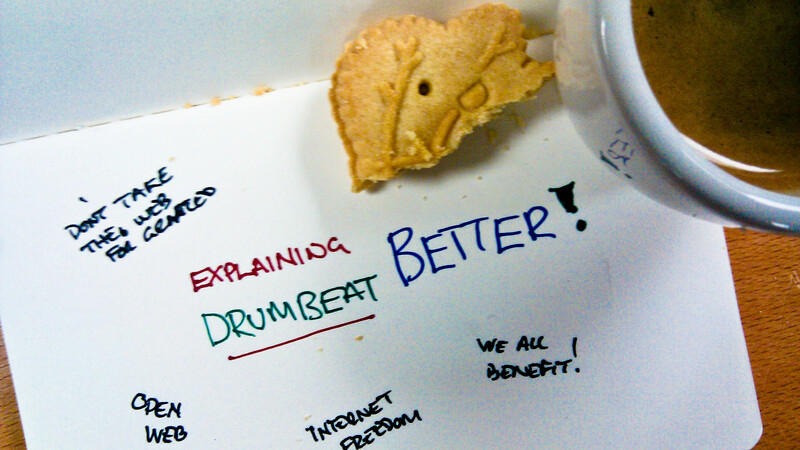 Drumbeat = your chance to keep the web open and free. A chance for the rest of us to get involved. A global community of smart, creative, everyday people who actually make and do things that attack problems, power big ideas, and build the open web. Who? Teachers. Lawyers. Artists. Bankers. Plumbers. Anyone who uses and loves the internet. You can get involved online or face-to-face. We’ve planted a flag. A place to gather and collaborate. Start a project, or join one that’s already rolling. If your project gets traction, we’ll shout from the top of the mountain about it. We may even fund it. Go to an event in your city. Work on a project with neighbors, or just paint a picture of what you want the web to look like in 100 years. It’s all about lending your skills and creativity to the cause of the open web. For those who are interested: the text above was very much fueled by community input. Major sources of input included comments my Drumbeat messaging post from a few weeks back plus a key messages thread in the Drumbeat newsgroup. Kudos go to Dharmishta Rood and Geoff MacDougall for pulling all these ideas together. You are currently browsing the messaging category at commonspace.